Explore the Broadway Theater District and some of the pubs that were actual speakeases during Prohibition on Urban Village Tours Broadway Prohibition Pub Crawl. Three hours and 1.1 miles of walking, your tour guide will show you the sights and teach you the history of the 1920’s on Broadway. You’ll find out where the major speakeasies were located, who some of the bootleggers were and where Broadway stars hung out. In between you’ll sip craft cocktails made by top bartenders. Small group tour (15 people max). Learn about how one of the most famous speakeasies would dispose of their spirits in the case of a police raid. 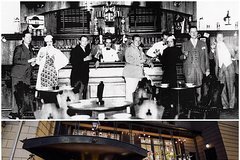 See a Victorian era hotel bar where the Bloody Mary was invented and learn how the wealthy skirted and scoffed at the laws. See where one of Prohibition’s most notorious gangsters was shot. Relive the location where the so-called “Queen of the Speakeasies” and a top bootlegger had one of their many nightclubs. And see where one of the most famous early 20th century showgirls tended bar. Includes one drink not to exceed $12 in value.